Like choosing the right doctor, choosing the right treatment option is an important decision. All braces are not the same! For beautiful, natural smiles, Dr. Ashraf prefers to use Damon Braces, the kind of braces that have small, discreet brackets and work with your natural facial structure to create a straight smile without removing permanent teeth. Dr. Ashraf is known by her patients (and their parents) for her gentle and caring approach, as well as her experience, knowledge and superior treatment results she has provided her patients. Dr. Ashraf's has been trained directly by Dr. Dwight Damon, the doctor who invented the system. She has successfully used Damon system with many patients of all ages, and likes the Damon system because it lessens the need for tooth extractions and is comfortable for her patients. The final result is a wide, fantastic smile that improves your entire face. Damon treatment is more comfortable and requires fewer office visits, but what really sets this approach apart is that it’s treatment without tightening. Damon braces use a slide mechanism to hold the archwire, reducing the amount of pressure exerted on the teeth and allowing the teeth to move more freely, quickly, and comfortably. Thanks to these innovative braces, achieving your perfect smile can be faster and easier than you ever thought possible! While the time needed in braces will vary from case to case, treatment time with Damon Smile is faster than with conventional braces. The Damon System also requires fewer office visits than traditional braces. That means more convenience for you, you family, and your lifestyle. 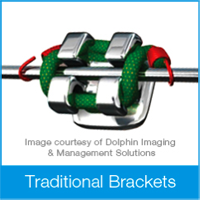 Damon system uses tie-less low friction brackets that don't need to be tightened and are gentle to the teeth and gums. Other styles of braces use elastics that bind archwires in place, which can cause pressure and discomfort. Very light "shape memory" titanium wires are used, gently guiding your teeth to their ideal position. 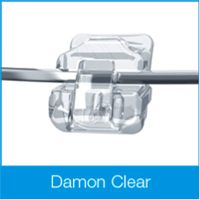 Damon Clear is part of the innovative Damon System, which combines tieless brackets and high technology archwires that are clinically proven to move teeth quickly and comfortably with spectacular results. Damon Clear combines the best of traditional clear braces and efficient technology to deliver a discrete treatment experience with results that go beyond straight teeth. With Damon Clear, people may not even realize you're wearing braces. 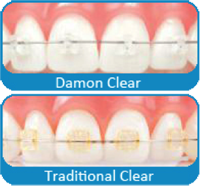 Tie-less Damon Clear braces are discrete and resistant to staining and discoloration throughout treatment.